Prime Minister Viorica Dancila had today, December 5, 2018, in Brussels, a meeting with the Secretary-General of the Council of the European Union Jeppe Tranholm –Mikkelsen. The meeting, attended by the Cabinet members, is part of the usual dialogue that the representatives of the member state holding the rotating Presidency of the Council of the European Union have with officials of European institutions. The Head of the Executive reconfirmed Romania’s commitment to having an efficient Presidency, with the aim of maintaining the unity and cohesion at EU level, in an European context marked by numerous challenges. At the same time, the Romanian Prime Minister succintly presented the advanced state of preparedness, outlining the fact that Romania is fully prepared for taking over the mandate of President of the Council of the EU starting January 1, 2019. Prime Minister Viorica Dancila voiced appreciation for the good collaboration with the General Secretariat of the Council throughout the preparations for taking over the rotating Presidency of the Council of the EU, both in terms of the aspects of substance, with emphasis on collaboration in drawing up the joint work programme for 18 months of the Council of the EU/ Trio Romania – Finland – Croatia, and in terms of the support granted by the General Secretariat of the Council for the professional training of Romanian experts with responsibilities in the process of negotiation of active dossiers at EU level. The Romanian Prime Minister also gave assurances that she will assume the role of facilitator of consensus, with a view to ensuring the necessary balance for the optimal unfolding of the Romanian Presidency of the Council. In his turn, the Secretary-General of the Council presented the role the Romanian Presidency will have in the relation with European institutions – Council, Commission and European Parliament. Prime Minister Viorica Dancila highlighted that given that the Romanian Presidency takes place at the end of a legislative cycle, the dialogue with the European Parliament will have a greater consistency in the first part of the mandate, until mid February. A set of technical and organizational details were discussed and the role of working groups in ensuring a successful mandate was highlighted. A series of topical issues on the European agenda were addressed: negotiation of the Multiannual Financial Framework, enlargement of the European Union and Brexit. Prime Minister Viorica Dancila voiced confidence in the continuation of an efficient cooperation with the General Secretariat of the Council during Romania’s first mandate at the helm of the Council of the European Union too, collaboration designed to contribute to the European agenda management, active dossiers negociation, and ensuring the continuity of the European legislative process. The joint meeting of the Romanian Government and the College of Commissioners, which is traditionally organized by the member states before assuming the Presidency of the Council of the European Union took place in Brussels, today. The main objective of the meeting was to present the major lines of the Programme of priorities in view of the Romanian presidency of the Council of the EU. At the same time, the meeting occasioned an exchange of opinions with the members of the College on the main European topics. The Romanian Prime Minister assured the European Commissioners that Romania is fully prepared to take over the Presidency of the Council of the European Union on January 1, 2019, and reiterated our commitment and will for an efficient and pragmatic presidency. Prime Minister also voiced Romania’s willingness to contribute in a constructive manner to defining and promoting the common European interest, to ensure unity and cohesion among the member states, and to bring citizens closer to the European Union. 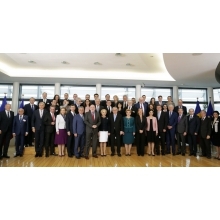 Recalling the motto of the Romanian Presidency of the Council, "Cohesion – a shared European value", Prime Minister Dăncilă pointed out once again that, during its tenure, Romania will promote a cohesion policy that responds to the increased need for economic, social and territorial convergence. The Head of the Romanian Executive also highlighted the main challenges that the Romanian Presidency will have to manage, such as the UK exiting the EU, negotiations on the Multiannual Financial Framework, and migration. In this context, Prime Minister emphasized the importance of close cooperation with the European institutions, especially with the European Commission, in order to obtain results and secure a successful tenure. Last but not least, Prime Minister Viorica Dancila voiced hope that the EU Summit to be held in Sibiu in May will confirm the general attachment to the idea of a united, consolidated and efficient Europe and will provide the main strategic guidelines for the future of the European Union. The Romanian Prime Minister also reconfirmed Romania’s interest in supporting the objectives of the EU external agenda, with an emphasis on advancing the European enlargement policy and securing greater consistency of the European Union action in its eastern neighborhood. Discussions continued within two thematic panels: the first addressing economic, financial and social aspects, including the Multiannual Financial Framework, and the second, the topics of migration, security and foreign relations. In the first panel, Minister of Public Finance Eugen Teodorovici and Minister-delegate for European Affairs George Ciamba addressed remarks on the multilateral financial framework negotiations, while Minister of European Funds Rovana Plumb spoke on the topic of economic and social convergence, and cohesion policy. The Romanian side emphasized the importance of the Multiannual Financial Framework, priority dossier for our country and expressed its full availability to work for the advancement of this dossier. On the part of the European Commission, presentations were delivered by the Vice –President of the Commission Vladis Dombrovskis and the European Commissioners Guenther Oettinger, Marianne Thyssen, Pierre Moscovici and Corina Creţu. In the second panel, the Romanian side’s presentations were delivered by Interior Minister Carmen Daniela Dan on security and migration, and by Foreign Affairs Minister Teodor Melescanu as regards Eastern Partnership, the Black Sea and the Western Balkans. First Vice –President of the European Commission Frans Timmermans, High Representative / Vice-President of the Commission Federica Mogherini and European Commissioners Johannes Hahn, Dimitris Avramopoulos and Julian King addressed remarks on the part of the European Commission. The European Commission President Jean-Claude Juncker appreciated the Romanian ministers’ speeches as very consistent and concluded that Romania is fully prepared to hold the rotating Presidency of the Council of the European Union. Jean –Claude Juncker: Madam Prime Minister, dear Viorica, I am particularly glad to welcome the Romanian Prime Minister and the Romanian Cabinet at the Commission’s headquarters to prepare the first Romanian presidency of the Council. It is a special event, because on the one hand, Romania just celebrated the Centennial, and secondly, it is Romania’s first presidency of the Council of the EU. We had a working meeting with all the Commissioners, that was translated into the Commission’s recognition of the fact that the Romanian Government is well prepared for the Presidency of the EU Council. It is equally a special moment as on January 1, 2019, it is 12 years since Romania became a member of the European Union. I remember the emotion felt on the day when, as the President of the EU Council at that time, in 2005, during Luxembourg Presidency, I signed on behalf of the European Union, the accession agreement of Romania to the EU. I had the feeling that finally, the two parts of Europe, which had been divided after the Second World War, and remained so for some time, reached reconciliation, history reconciled with European geography. Without Romania, the European Union wouldn’t be complete, it is complete today,as, after decades of artificial separation, we need to say it, it is part of the European family and it is forever anchored here. The Romanian Presidency comes in a crucial moment for the future of the EU. During Romanian Presidency, the UK will leave the EU on March 29, next year, it’s a sad date, but Romania will know how to manage the post-Brexit period in the best way possible. Extraordinarily difficult prerogatives lie ahead for Romania, on the road to the Sibiu Summit we must agree on the basic lines of the future financial agreement, of the multiannual financial framework. There are 257 legislative proposals still on the table of co-legislators. The Austrian presidency will finalize several dossiers, but a lot of work will be left for the Romanian presidency in a very brief period, because the European Parliament will conclude its activities in April, therefore, about four months of activity remain for the Romanian presidency. We have seen today how well-prepared the Ministers are in their fields of activity and I’m convinced that Romania will manage to finalize many projects that are on the table of the Parliament and of the Council. I believe the EC’s programmes and the Romanian Government’s programmes meet in very many points. There are also certain divergences in what concerns the development of the rule of law, we discussed this issue, but this issue does not concern the Romanian presidency of the Council of the EU, it has to do with the bilateral relationship between Romania and the European Commission or the EU. I’m convinced that we will welcome Romania in the Schengen Area before this Commission’s term in office finishes. But there are still efforts to be done, and we will achieve this result, and now, I will give the floor to Mrs. Prime Minister and to Mrs. Corina Cretu who has an excellent activity within the Commission. I had the pleasure to welcome Madam Prime Minister and now, you have the floor. Viorica Dancila: Thank you, dear Jean –Claude! Today, we had a meeting with the College of Commissioners, one that is part of the meetings prior to Romania’s taking over the presidency of the Council of the EU on January 1, 2019. We discussed cooperation between the Romanian Government, the future presidency and the European Commission and I also presented the priorities of the rotating presidency of Romania starting January 1 next year. We had constructive talks, we addressed topics which will be on the European agenda over the next period, topics, I might say even challenges, to which the European institutions have to respond together. I listened carefully to the opinions of the European Commissioners, the Cabinet members also expressed theirs, and I noticed that many of the topics addressed, many of these challenges have elements in common and there is especially the will to find solutions during Romania’s presidency. I reiterated the fact that Romania wants an ambitious but also realistic presidency. Ambitious in the sense of carrying through as many dossiers currently on the working table as possible, of having at least a political accord on the multiannual financial framework, of being able to solve as many dossiers as possible from among the 257 dossiers mentioned by the President Juncker, and I believe this is important, because during Romania’s rotating presidency, the strategic agenda 2014 -2019 is completed, and the results obtained will be the results of all the European institutions, and especially, of all the EU member states; realistic because we know that Romania will have the role of impartial mediator, enabler of balance and consensus, and I believe we must achieve consensus among member states on important dossiers. Europe is divided from this standpoint and it won’t be easy to achieve this. We are looking forward to the College of Commissioners’s presence in Bucharest, on January 10-11, next year, to discuss in a much more applied way each dossier. I want to further mention the fact that during these days in which we were here, in Brussels, there were talks between Romanian Ministers and European Commissioners, between Ministers and chairs of committees in the European Parliament so that we can have a smooth transition regarding the important dossiers we have to solve on the European agenda. I would like to thank once again Mr. President, the European Commissioners for their approach, for the constructive dialogue, the support and we are very glad for the fact that the European Commission is convinced that we are well-prepared, that we can takeover and successfully exercise the rotating Presidency of the European Union as of January 1, 2019. We already spoke about the challenges we have ahead. As a Commissioner for regional policy, I am very pleased to see that the cohesion policy is at the core of the interests and priorities of the Romanian Presidency of the Council of the EU. I would like just to wish you good luck and to reassure you that the Commission, of course Mr President and all of us, we are all mobilised at all levels to support the Romanian authorities in achieving a successful Presidency. Thank you very much, Mr. President for your appreciation! Reporter: Mr. President, I would like to ask you, in our country, we are discussing a possible challenge to the Cooperation and Verification Mechanism, most likely at the European Court of Justice. I would like to ask you if you have had any discussion on this subject and, in this context, considering that the last report has some extra points, do you still see any deadline to lift this Mechanism during this Commission’s term of office? Thank you! Jean –Claude Juncker: My intention still is to make Romania a member of Schengen. As you already know, in the last report [regarding the Mechanism of Cooperation and Verification] I drew attention of the Romanian authorities on some weaknesses and together [the Romanian authorities and the EU ones] we have worked to improve Romania’s preparedness for the accession to the Schengen Area. I wish to end my mandate after Romania becomes member of the Schengen Area, but some efforts need to be done in this respect. Reporter: Mr. President, you underlined the fact that Romania, following what you discussed today too, is prepared to takeover the presidency of the Council of the European Union. We know very well that there are important dossiers on Romania’s table – the Brexit, the budget. In your view, how can Romania contribute to the successful resolution of these dossiers? Jean –Claude Juncker: I would like Romania to bring the Romanian common sense in the Romanian process. As regards Brexit, we do not know what the British Parliament’s decision will be. The vote will take place on December 11. Today, the Commission sent its agreement to the Council, because it has to be signed by the Council too, myself and Mr Tusk, I do not know what the protocol order is in this case, it is very complicated, but after the vote in Parliament, and after the withdrawal of the United Kingdom, it will be our job, of the Commission and the Romanian Presidency of the Council of the EU to decide on the next steps. But everything depends on the vote of the Parliament. Reporter: There were a series of question marks about the rule of law and the judiciary in Romania. You said it is a bilateral issue. You will take over the Presidency when Hungary and Poland are already faced with problems regarding the rule of law. Do you think the Parliament will have confidence or will it express some doubts over Romania’s being the most appropriate to chair the EU Council in this context? How can you calm these concerns? And, Commissioner, you are responsible for the structural funds. What we have seen especially in Hungary is that it is a link between problems with the rule of law and the corruption. How can this link be ... during the Romanian Presidency? Viorica Dancila: In Romania. the rule of law is observed, and all efforts are made for the independence of the judiciary and the rule of law observance. Poland, Hungary and Romania should not be placed on the same level. It’s a special situation and I would like us to take into account this aspect. Otherwise, considering the fact that we are saying and we are convinced that the rule of law is observed in Romania, I see no connection between Romania exercising the rotating presidency and this issue. I consider that Romania has taken important steps, Romania is taking important steps, the rule of law is observed in Romania and, at the same time, I must say that Romania wants a successful presidency of the Council of the EU. Corina Cretu: As regards your question, I would like to say that last week, we were in the ACOM Commission in which we presented the cohesion policy. We have succeeded in having a 3 percent error rate from 5.5 when I became the Commissioner for Regional Policy. From this, only 0.4 percent is fraud. You know very well that the European Commission has zero tolerance to fraud, and you know that we suspend immediately all the funds when OLAF finds a fraud, and we apply financial corrections in order to recover funds in the EU budget. Then, it’s up to the respective states to recover from the companies the money, but, as I said, now the current level of fraud is 0.4, is in fact less than 0.5 percent from the total of billions of euros invested in the new member states . Reporter: Mr. President, Madam Prime Minister, is it surreal for us to discuss here and at the same time, in Bucharest, the governmental majority lost power in fact, next week, a censure motion is likely to be voted. My question is very simple: is there any risk for the Romanian Presidency of the Council of the EU and does the Commission call for political stability or does it abstain from sending a message? Jean Claude Juncker: Well, we discussed here but you are mixing up the situation, it does not seem to fit reality. In fact, I believe there is a majority in both Chambers of Parliament, in fact, that being said, the more Romania makes progress in observing the rule of law and fighting corruption, the more successful its Presidency of the Council of the EU will be, and we will remain in touch anyway. Viorica Dancila: We did not lose the parliamentary majority. Don’t confuse the two seats in the Chamber of Deputies with the majority. The majority means the Chamber of Deputies and the Senate. We have support for the Government in the Parliament of Romania and I’m not nervous at all in what concerns the censure motion. Reporter: Last month, the Data Protection Authority imposed a very large fine on journalists working on corruption investigations. Would you like to explain us, in your opinion, if this does not somehow strengthen Romania's negative image and actually complicate your efforts to defend its reputation? Viorica Dăncilă: Definitely not. The Constitution of Romania stipulates the right to freedom of opinion and expression. This is guaranteed and every journalist enjoys it too. But at the same time, we have an European data protection regulation. If these rights are violated, if privacy is violated, if personal data are used, everyone, regardless of where they come from, regardless of who they are, should be sanctioned in accordance with European rules. As long as we have a European regulation, it is not optional, it is mandatory and in Romania, this regulation has been applied.